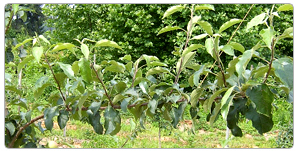 Tree Weight : Facilitating the differentiation of flower bud and making the ideal tree shapes. 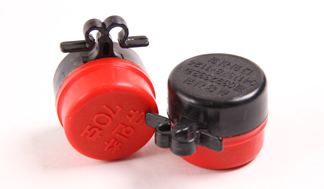 Tree Weight is an eco-friendly alternative existing cement weights or nut weights. By restraining vegetative growth, transforming into generative growth and getting flower bud can be much easier. 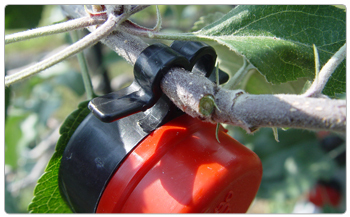 Since you can put apple wherever you want with Tree Weight, getting high quality fruits, enough sunlight, stable tree shapes and avoiding biennial bearing can be possible. Putting the ring on the branch that you want to train. Lock the ring on the branch. 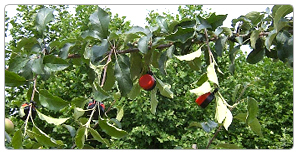 Since conventional Tree Weights are industrial half-finished goods, other materials and labor are necessary As it is a finished product only for fruit trees, you can use immediately. 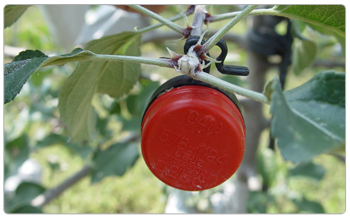 securing flower buds and producing high quality fruits could be possible. 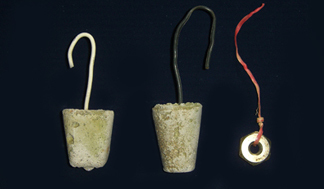 (幼木) from June to October Compared to using the wire, using a Tree Weight can save you a lot of effort. 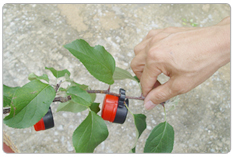 2nd-May to June 1st: Shaping branches even if there are no flower buds improves creation of fruiting spur and photo environment. 2nd basal shoot from July to middle of September Nutrition from restrained second growth and photosynthesis makes hypertrophic fruits effects. Basically, farm owners judge when to shape branches, missing the right timing happens frequently. Since too many works are pressed in the spring, lack of labor is the common reason. Shaping the branches in an appropriate time is the best but doing whenever you are free is still fine. This will make trees to grow only to upside but being not be nutritious and making no flower buds. Branches with no flower buds will be cut in the winter. 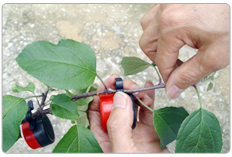 ( ) Putting Tree Weight on shoots makes the fore-end of branch to head the ground. After shaping the branch The fore-end of tentillium maintains the degree bigger than horizontal level and apical dominancy. 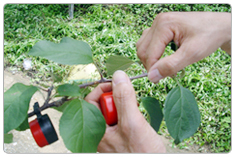 In case of M9, when shoot grows until 15cm, and in case of M26, 25 cm, shape branches selectively in the light of the location of fruit setting. Shaped shoot stops growing, creates flower bud at the end of the branch and flower buds get bigger at the same time. 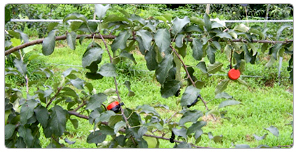 Stored nutrients through photosynthesis move to fruits and facilitate hypertrophy of the fruit in that year. In the next year, fruit spur on the tentillium should be shaped again by training shoot created after thinning out the superfluous fruits. You can just leave those not shaped branches for too many shoots on the tentillium and arrange them in the September. If you remove right after shaping the branches, the possibility of secondary growth of shoot would be high.